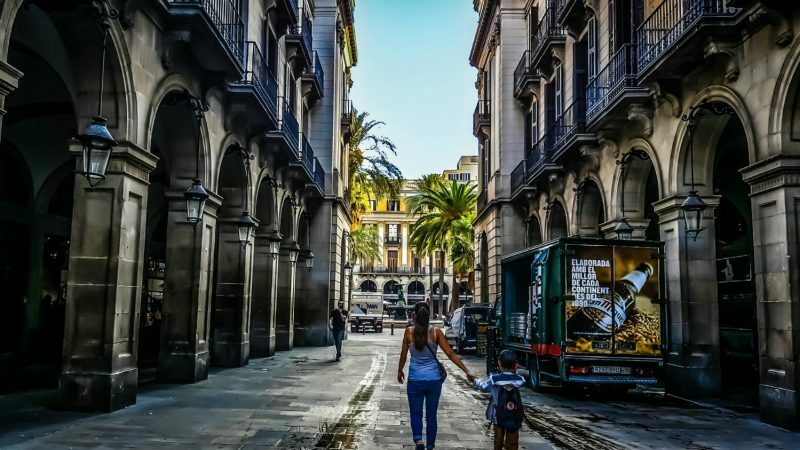 Barcelona is a city that adores kids; children are welcome everywhere (the idea of a babysitter so you can go out to dinner is unheard of here). There is plenty to do with college age kids, too, like free tours, shoe shopping, food shopping, flamenco, walks on the beach and time at the pool. The city is easy to navigate and locals are kind and helpful. 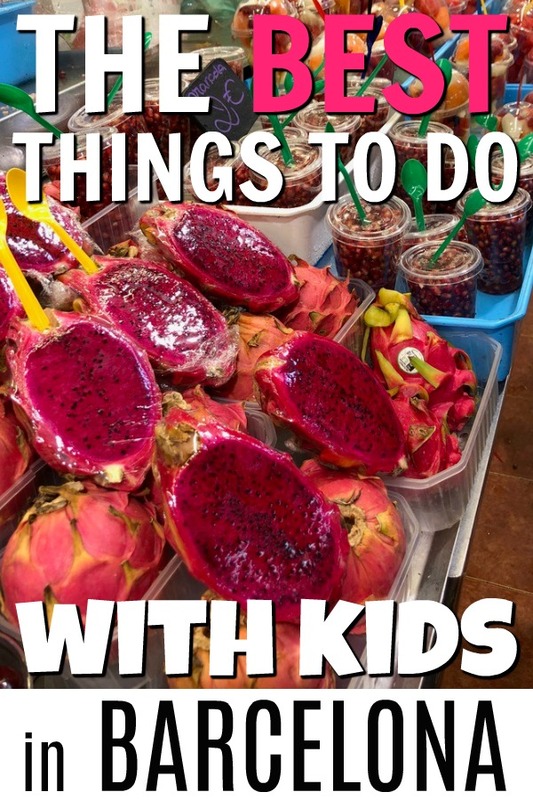 Here’s our TravelingMom’s list of ideal things to do in Barcelona with kids and college kids. After our cruise ended in Barcelona, my 20-year-old daughter and I were ready to explore this Spanish city. We wandered around Barcelona by bus and on foot, stayed in an AirBnB and a big chain hotel, shopped, ate and explored. We came without an itinerary and left with two extra suitcases filled with finds. What should we do on our first day in Barcelona? The Hop-on-Hop-off bus offers a 24-hour ride in and around Barcelona. Riding it gave us a taste of everything there is to see and do in Barcelona. We followed along with the audio tour to get the lay of the land. It’s like a “Barcelona Highlights Drive-By,” with light info offered via an audio tour. The bus tour was perfect for our first night because we were too tired to walk around for hours but wanted to get a sense of the city. 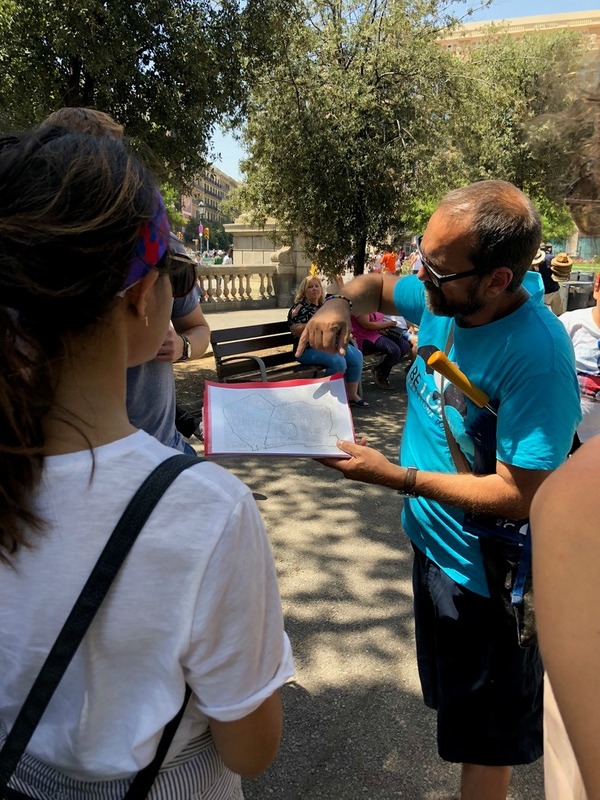 Since everything in Barcelona is relatively spread out, this was such a simple way to figure out where everything is, how to get there and how to organize the rest of our vacation. It was a worthwhile investment (starts at $31) and any of the Hop-on-Hop-off companies will do. Finding Italian pizza was also a must on first day because somehow we missed that when our cruise ship stopped in Florence. Tapas would come later. Add this to your list if you like pizza because it is THAT GOOD and reasonably priced: N.A.P: Neapolitan Authentic Pizza. Charming, funny wait staff and delicious food and drinks. What’s the best neighborhood in Barcelona? Barcelona is famous for having a bit of everything, from the mountains to the sea. The upper part of the city is newer and more modern, while the lower part down by the sea is ancient. The Eixample (pronounced “eh- shampla”in Catalan, the local language) district joins the two. But our favorite neighborhood in Barcelona, with a rich, interesting history, was the Gothic Quarter (Barrio Gotico). We joined Be Local Tours for a FREE walking tour of the Gothic Quarter. Get ready, because I am going to gush a little here: This tour was two hours and we felt like we were on a big adventure as we explored. Our fantastic and super-knowledgeable guide, David, was born and raised in Barcelona and pointed out nuances in the city that we definitely would have missed on our own: fascinating details like why there are bullet holes in the park statues and buildings all over the city (hint: Spanish Civil War), how modernism nearly killed Gothic architecture, why Gothic architecture was created, the Catalan independence movement, and so on. The tour is totally free. The guide works only for tips, so be sure to have some cash with you. Our guided tour of La Sagrada Familia cathedral was 43 euros each, and not nearly as fun and interesting as our Be Local tour. Tip well because it is worth it! 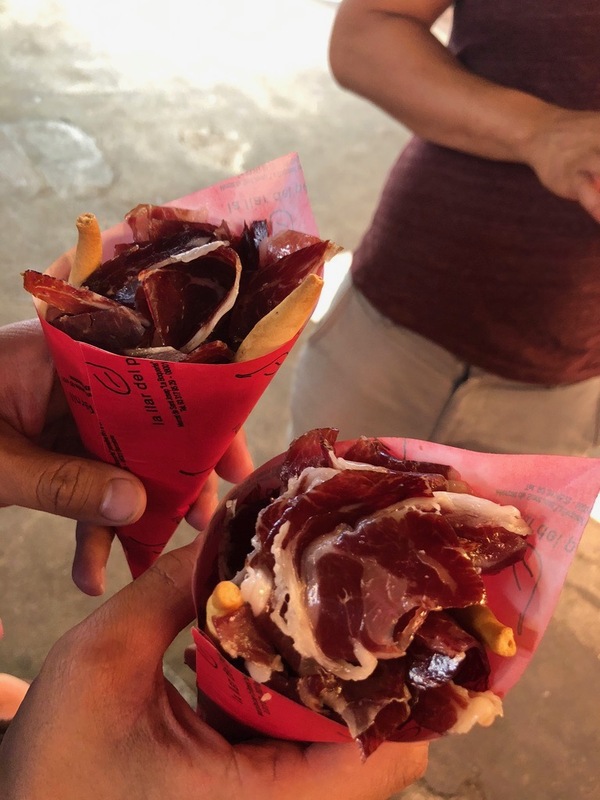 TravelingMom Tip: Looking for authentic Catalan or Spanish fare? Ask your Be Local guide for local favorites. What’s a must-see tourist attraction in Barcelona? The MUST SEE is Gaudi’s renowned La Sagrada Familia Basilica, the church that’s been under construction since 1882. It is expected to be completed in 2026 (don’t hire their contractors) but because it is a 100% publicly-funded project, the completion date has been extended several times over the years. Gaudi’s architectural theme is embellishment to the MAX- almost gaudy until you understand the story that IS the building. One example: Giant Gothic church steeples accented with colorful fruit baskets that represent the seasons. It’s quite possibly the most exquisite church ever created, with a hands-on museum that walks you through the history. Buy tickets as soon as you know you are going because the visitation times do sell out. Your ticket will specify the time for you to enter the church for your tour, which reduces waiting in line. This helps organize the (ten) thousands of people who line up each day to visit. TravelingMom Tip 1: La Sagrada Familia is huge; it’s hard to know where to start. 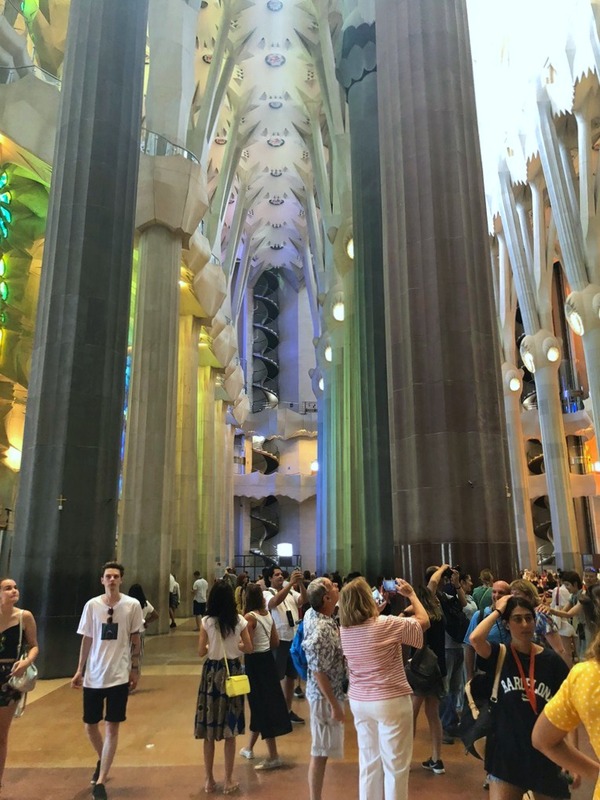 Book a tour like the Sagrada Familia Guided Tour from Viator that we took. It helped us understand the evolution of the church and avoid waiting in line. TravelingMom Tip 2: If you choose to tour the church on your own, start with the museum. It explains it all and gives context for your tour inside. What should we do in the evening in Barcelona? When in Barcelona… expect to see families with small children out late at night. 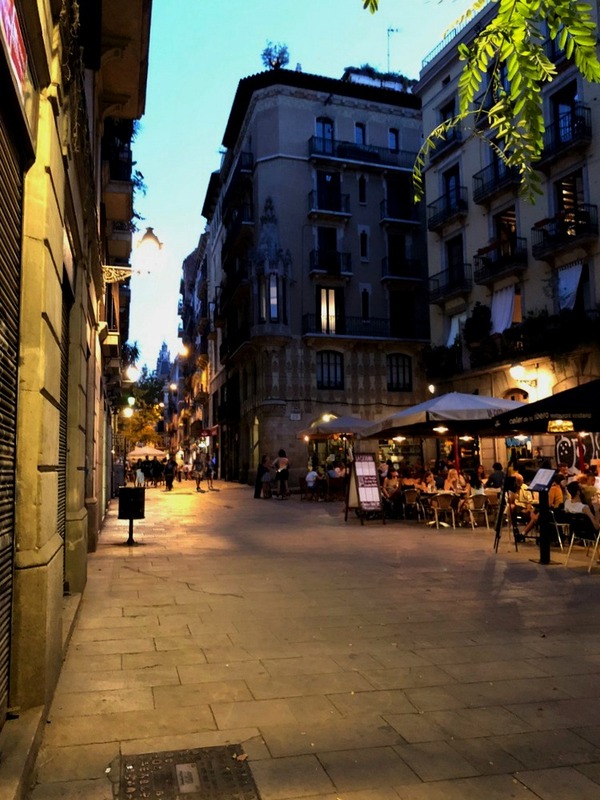 Join the fun: skip bedtimes (you’re on vacation, after all), and eat out late, or check out a flamenco dance show on La Rambla, the bustling tourist epicenter of Barcelona. Yes, this is a totally touristy area, but one that you have to see. TravelingMom Tip: When visiting the Plaza Catalunya and/or La Rambla (full of tourists, but definitely worth a visit), wear a fanny pack (front facing) or a crossbody bag, or wear your backpack on your front. Both areas are notorious for pickpockets. Flamenco shows (called tablaos) are traditionally a specialty in the south of Spain, from Andalucia province, but you can find some shows in Barcelona that cater mainly for tourists–the trick is to find an authentic one of good quality. After doing some research, we chose Tablao Flamenco Cordobes and we were not disappointed even though we sat in the very back row. The place is small-ish, seating maybe 150 people in a U shape around a small stage. But the talent is HUGE, and passionate. For a place like this, with three shows each day, I was concerned that the show would feel rote. But I could not have been more wrong. I felt like the singers, dancers and musicians were thrilled to be performing for us. The energy was fantastic. I think it helped that no phones and cameras are allowed to get in the way of the performance. Photos are allowed only during the last 10 minutes. I would see it again. And again. TravelingMom Tip: if you purchase dinner with the show, you’ll get a better seat. If you don’t want dinner, buy your tickets as early as possible so you get closer to the front row. Why should we bring a separate suitcase to Barcelona? Because the shopping is totally amazing. My 20 year old daughter and I did some ninja shoe shopping. My husband didn’t do so bad himself for being there only 2 nights. There are artisan shirt, suit and shoemakers and big chain stores like H&M, Uniqlo and Zara (which is everywhere, as it is Spanish). We did not discriminate; we hit them all. Spain is known for its quality leather, so you can often find excellent bags and shoes at reasonable prices in smaller shops. My favorite find? 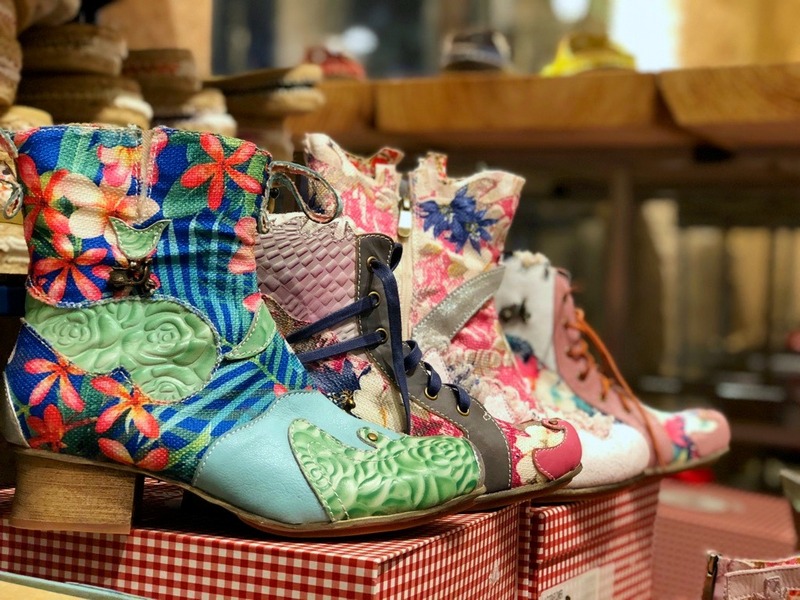 Glamor Shoes in El Born. They had a sale on my new favorite sandal, Laura Vita shoes and walking shoes: Slow Walkers. We liked it so much that we bought more once we got home. Shopping can also be an education of sorts. One of the best (and for me, most confusing) benefits of shopping in Europe is the tax refund program for tourists. Get your junior shopping ninjas involved. Collect your receipts for bills that exceed 90 euros, and receive a tax refund for all of them at the VAT refund kiosk at the airport. Ask each store for their stamp and form BEFORE you leave the store. Be persistent – some sales people were quick to brush me off saying I could manage everything at the airport. That is not true. You must have stamped forms from each store. You will need that at the VAT desk. Be sure to spend at least a couple of hours wandering the aisles of the picturesque La Boqueria open-air food market. It’s a huge colorful market that has been around since its first meat stalls opened in 1200. La Boqueria stocks every type of candy, nuts, oils, fish, herbs and even tapas. We loved hanging out here, eating our way through the market and stashing food for home and for gifts. My daughter is a college student and 50% Italian. Someone asked her recently if she would prefer to study abroad in Italy or Spain. Her response? Barcelona. Definitely Barcelona. When I asked why, she said she loved the history and personality and most of all it is easy to navigate. I promised not to tell her Nonna. Where should we stay in Barcelona? We split our visit between two very different spots. The first was a 2 bedroom “hotel” apartment called Aparthotel Barcelona Napols in Eixample, which we booked on AirBnB. It is a 20-minute walk from the center of Barcelona and staying there made us feel like we were locals. We shopped at the grocery store around the corner and got mani-pedis across the street at a local nail salon (neighborhood beauty salons–a ”salon estetica”–can be found everywhere). Even though we were very close to bus and subway stops, we enjoyed walking to get downtown, taking a different route each time. I asked locals about the neighborhood and they said that it is very safe but reminded us to always be careful in a big city – the pickpockets are real. There is no pool or concierge service here, but the receptionist was always happy to help with directions and recommendations. 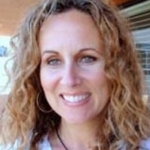 TravelingMom Tip: Book port or airport transfers via the Apart Napols site. It was less expensive than booking it on our own. Next, we had a totally different experience at the seaside Hotel Hilton Diagonal Mar, about 20 minutes by car from the city center. It’s very close to the port, which means a lot of cruise passengers stay there, including many Americans. 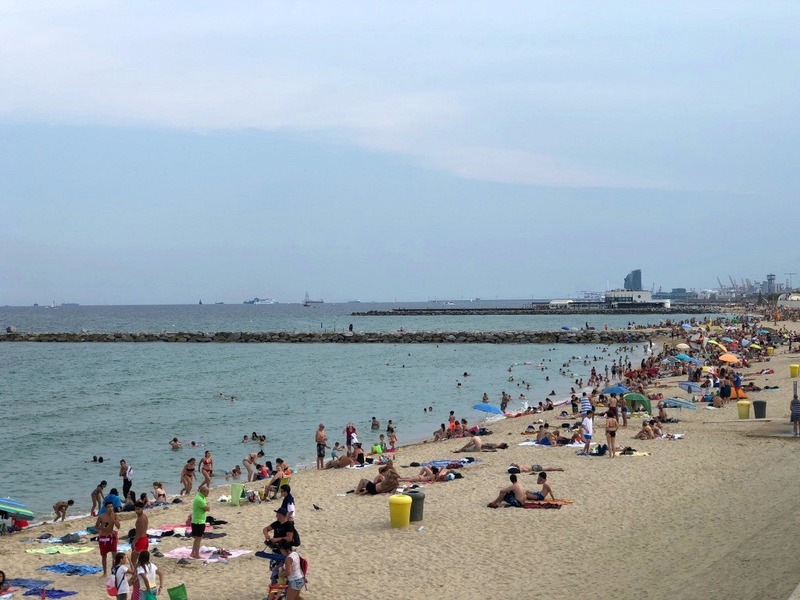 It’s a 10-minute walk to the beach, which is an amazing feature if you’re visiting Barcelona in the warmer months. The hotel atmosphere is beachy, light and upscale but not pretentious. Families will feel welcome here, but there is no kids club or spa. For an additional fee, you can bring your pet as long as it is less than 34kg. Accessibility features for travelers with challenges are also available. 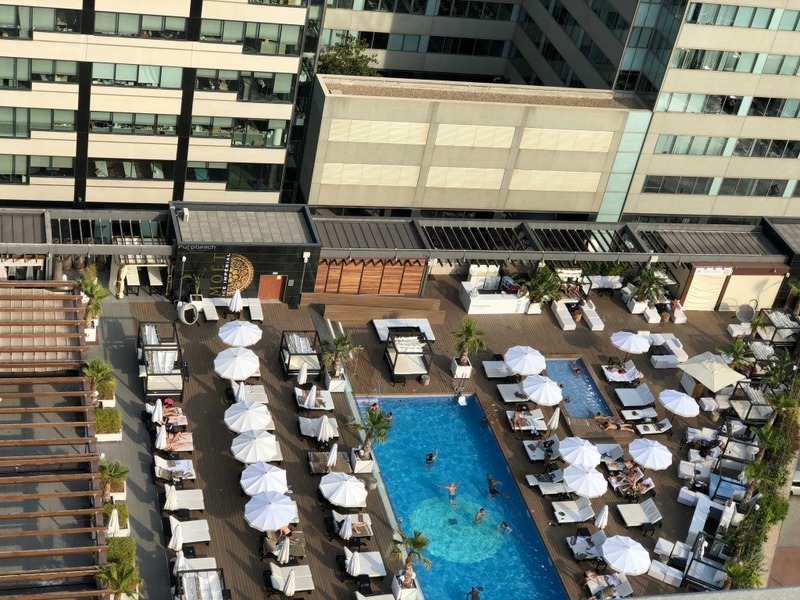 The pool at the Hilton Diagonal Mar is open to locals for a fee. Keep in mind – it gets very busy on the weekends. There is a reserved area with lounge chairs and umbrellas just for guests, but it’s not close to the pool. Cabanas near the pool are available via reservation and a fee. The weekend atmosphere feels like a party, which older teens might love but may not be as fun for younger kids who want to splash around and are not interested in loud bumping music. One of my good friends from college stayed with us in Barcelona, and the three of us were very comfortable in our double hotel room, even with a rollaway bed. We took advantage of the breakfast buffet which offered everything from the delicious Catalan ”pa amb tomaquet” (bread with tomatoes smashed into it) to fresh fruit and made-to-order omelets. A highlight of our stay at Hilton Diagonal Mar was visiting the executive lounge that overlooked the sea. This is perfect for families and is available for guests staying in an executive level room or above. We had access to snacks and drinks throughout the day, and terrific hot and cold appetizers in the evening–all with a gorgeous view of the Mediterranean Sea. We made a point of being in the lounge in the evening so we could watch the sunset. Across the street is Diagonal Mar, a fantastic mall with restaurants, a cinema, food court and 200 shops. We liked GreenVita, a vegan restaurant at the mall, where we could enjoy healthy food and outdoor seating (unless there were smokers nearby). The service is not fast but the food is good. There is a playground and outdoor events in the courtyard. Cut through the mall, exit the other side and you will find the tram that will take you to other beaches (but not directly downtown). We rode the tram for fun and to get a feel for how to use it. We wound up needing a little help from a friendly local, but still enjoyed the ride. There is public transportation nearby. but we used Uber most of the time to save time getting into the city center. 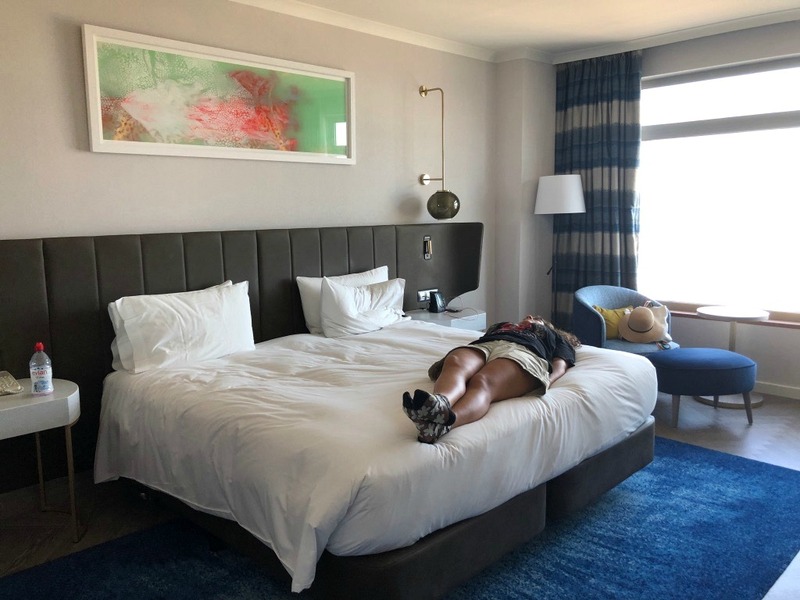 The hotel is a 5 minute walk to the beach where there is a lot to do: rent bikes, go boating/fishing, eat great seafood or just walk along the coast. 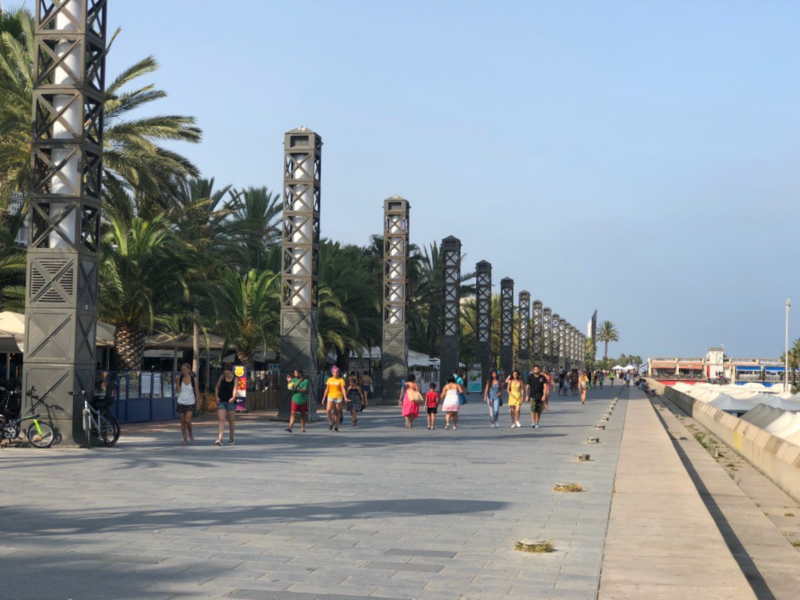 The Barceloneta (meaning “little Barcelona”) is also within walking distance. It’s a seaside neighborhood on a little spit of land with its own beach, packed with seafood restaurants and kiosks and tapas bars. We took the tram to the Port Olimpic complex (built for the 1992 Olympic Games held in Barcelona) where there is a scenic walking path and assorted restaurants and bars. We walked around and stopped at Pans & Company for a sandwich and to people watch. My daughter summed it up best when she said that Barcelona became her first choice for studying abroad thanks to our trip. Studying abroad is a big decision for students and parents. Now that I have experienced Barcelona and can vouch for its safety and navigability, it has moved to my the top of my list of destinations for her, too. Next Post: So You Want to Write for TravelingMom. Here’s How!